With the prominence politics plays in the everyday lives of most Americans, finding its way on our television screens, on our radios and in our newspapers, it makes sense that it would find its way onto our stages as well. However, unlike the slanted views we receive and are forced to deal with from these mediums, making it nearly impossible to decipher through the hidden agendas and bias to find out what the truth may possibly be, director Sara Wolkowitz’s “War Crimes,” written by Sergei Burbank, tells us a story that in the end, paints an accurate and mind-blowing message about the state of the world. What originally appears as somewhat heady [with a 17th century Danish business man, Pieter Schaghen, eventually played marvelously by Dave Nelson, introducing the setting and ideas of the production somewhat long-windedly] is made so relatable and true to life that you can’t help but take the message seriously. Putting the characters in the piece and not the countries involved in the forefront, we see firsthand how terrorism and overt-nationalism affects every country and every person. What first feels like a uber liberal message is smoothed out over time, as every country, person and thing involved in the story finds a way to keep their selfish goals ahead of what is right. Even the one person who ends up going out of his way to pay for his crimes, American John Warder [played by the stage-savvy and endearing Timothy Roselle] pays the ultimate price for his honesty, proving that there are problems in the world that need fixing and soon. Finding a way to put a face to every country in a drama spanning the globe with solid actors is no easy task, but Alexis MacDonald’s portrayal of French Liberal lawyer Pascal does this to perfection and sets the tone for the rest of the production. Feeling the need to do the right thing for the sake of the world, but lacking the fortitude, Pascal’s ultimate decision proves to be a shocking one. In spite of her lacking French accent, MacDonald’s emotions are clearly visible and proves herself to be one of the driving forces in the production. The same thing goes for Laura Piquado, who does an excellent job as the English Judge, Thomasina More. With excellent stage presence, More delivers her lines with command and vigor, yet with the quiet desperation of a woman who is witnessing her own, and the world’s fall from grace. Add in a stellar performance from Hugh Sinclair as the arrogant and lost, but somewhat charming [there’s a little of his character in all of us] American President John Adamson and the adorably at-home and comfortable performance of Sarah Hartmann, as Warder’s conflicted wife and you have enough talent on the stage, that when combined with interesting production values (video scenes in between the actual performance), make for a one of a kind drama. Understanding many of the elements of this performance could have been a nearly impossible task, as the language is often heavily weighed in political and legal jargon at times, but the characters, their motives and the consequences of their actions are not. Crystal clear, vivid and expansive, the ideas expressed in “War Crimes” are poignant, thought-provoking and equally as important. 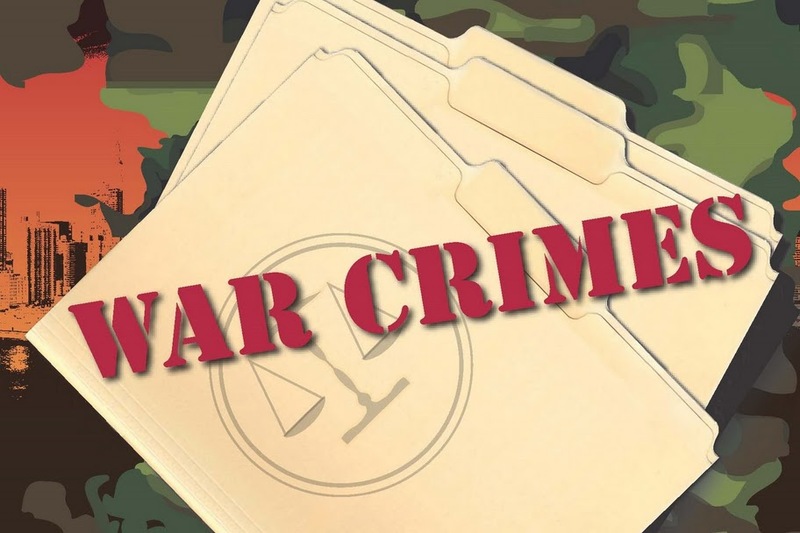 Because of this and behind excellent writing and directing by Burbank and Wolkowitz and a cast loaded with depth, “War Crimes” is an independent theater production that deserves a much larger stage.